I hate when monuments are in traffic circles because 99.9 percent of people passing by can’t take a second to see them. Not if you don’t want to smash into someone. I know some of these monuments were here before cars, but it’s ones like the Peace Monument at Pennsylvania Ave. and First St. N.W. by the U.S. Capitol that are completely ignored. And, that’s a shame. 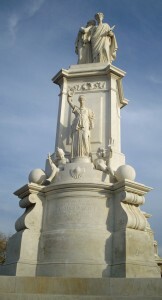 The Peace Monument, once known as the Navy Monument, is one of those pieces that requires more than a passing thought. The two allegorical females atop are America weeping on the shoulder of History (OK, that’s a heavy thought for the day) over the loss of sailors during the Civil War. 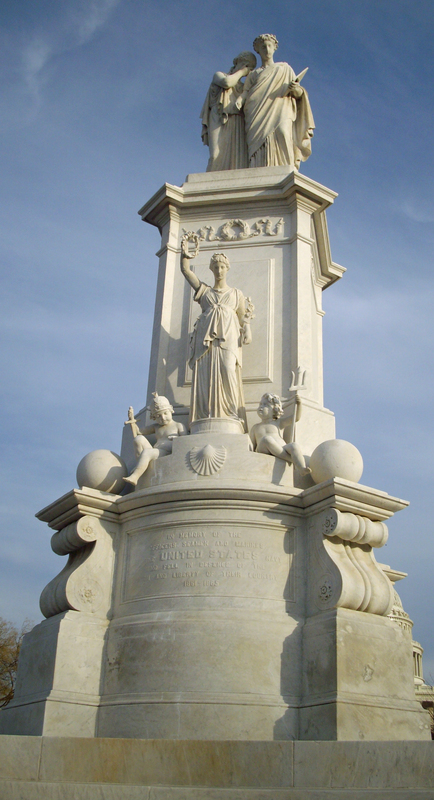 There are several other symbols representing war, victory and peace on the 1877 monument that 99.9 percent of passersby won’t remember anyway so they might as well continue looking for a parking spot in vain. The Peace Monument won’t change your life, but it’s nice to look at for a moment. So, slow down and smell the monument. This entry was posted in Monuments and Statues and tagged free Washington D.C. attractions, Peace Monument, Photo by Rick Snider. Bookmark the permalink. Indeed the location of that monument has never lent itself for drivers to appreciate, and it’s far enough away from the major attractions on the Mall for people to ignore. Thanks for reminding me again of the treasures of our fine hometown.